This little coffee shop is completely ’80s-themed. Into Back to the Future? This is the place for you. They literally have a DeLorean mounted at the back of store surrounded by walls of 1980’s nostalgic memorabilia. Plus, you can get your coffee in a Star Wars themed mug. The wifi password? It’s stored on a 5″ floppy disk. If you’re a DePaul student, you’ve probably already heard of Bourgeois Pig. Located just a few blocks from the quad, it has an incredibly cozy vibe, sandwiches with literary names (“The Sun Also Rises”, for example), and it’s super peaceful and quiet. It’s the perfect place to completely immerse yourself in schoolwork. If you combined a Pottery Barn catalog, a bike shop, and a coffee joint, you’d have Heritage Bicycles. This bright cafe doubles as a bike store, offering all your cycling service needs. Plus, their lattes are to die for. If you’re in need of a sunny atmosphere with a chill vibe, head over to this place, stat. This all-day cafe is definitely a hidden gem in the loop. Their hot chocolates and banana bread slices are both superb. Also, here’s a tip: their happy hour is from 5 – 7PM every day, which means all their food items are half off! Wired is absolutely my favorite place to tune out the rest of the world. A hidden treasure, the place doesn’t look like much outfront, but inside they offer a really easy going atmosphere with plenty of seating and board games to boot. Also, they have a really solid selection of international coffees! Now that you have this short and sweet list, go out and study, DePaulians! These coffee shops definitely won’t disappoint! Who doesn’t love ice skating? I mean, if it’s cold, you might as well be doing something fun with the cold, right? From November to March, Millennium Park offers free ice skating daily. Bring your family or a couple of friends to good ‘ol Millennium and enjoy a day of gliding (or, in my case, falling) next to a bunch of super cool Chicago monuments. Listen, I know Lincoln Park Zoo is next to Lake Michigan and I know that means the wind chill makes the cold that much worse, but ZooLights is worth it. First of all, it’s free, and secondly, you can walk around the Lincoln Park Zoo looking at a bunch of really impressive light sculptures while Mariah Carey’s “All I Want for Christmas Is You” plays in the background. First of all, the Art Institute is indoors and that means warmth, but secondly, it features a bunch of timeless pieces of art from all over the globe. If you haven’t been, it’s a definite must. Dedicate a day to it at least, because you’ll get absorbed in all the artwork pretty quickly. Plus, you can use your Demon Discount here! It’s totally free for DePaul students. Like the Art Institute, the Chicago History Museum is indoors and toasty (because that’s the most important part, right? Just kidding… kind of). If artwork isn’t really your thing though, the Chicago History Museum is the place for you. Demon Discounts apply here too — free admission! The Garfield Park Conservatory is one of my favorite places in Chicago, honestly. If you’re constantly seeking some sort of image of thriving vegetation and life, take a day trip here. It’s free and the whole thing’s under huge, beautiful glass greenhouses. Water Tower Place is one of those shopping malls you expect to go into for 30 minutes and, in reality, you end up staying for about 3 hours. No shame, though — the place has about 95 attractions (including Food Life which is a definite must). The Macy’s Window Displays have, for me, been the quintessential epitome of the holiday season. Even though the holiday’s are over, stop by and check them out. It’s outside, but with the months of hard work that goes into them, totally worth it. Going to the movies is, without a doubt, my favorite thing. Food, comfy chairs, and a giant movie screen all in one place? Yes, please. Best part? Demon Discounts apply at AMC Theaters too. Also, Star Wars: The Force Awakens is out right now and if you haven’t seen it you really, really need to. It’s amazing. I don’t know a single person who doesn’t like laughing and really funny people. Fortunately, Second City provides both of those things, and it’s accessible via Demon Discounts. Enjoy a night full of giggling and stop by to see some of Chicago’s funniest. Ok, I’m a bit of a hot chocolate aficionado, and Mindy’s Hot Chocolate is some of the best I’ve ever had, ever. Guys, there’s 9 different types of hot chocolate (I didn’t even know that was possible?! ); from the classic Old-Fashioned to Eggnog to Affogato (which has this coffee cocoa ice cream that I literally dream about on a daily basis). Plus, getting a nice, warm cup of hot cocoa is great way to end a day full of activities. Sure, Chicago’s cold weather isn’t something to get super excited about, but the activities provided by the city during its colder months are, without a doubt, some of the best. Get out there and enjoy it! Spring Break Has Begun, Now What To Do? 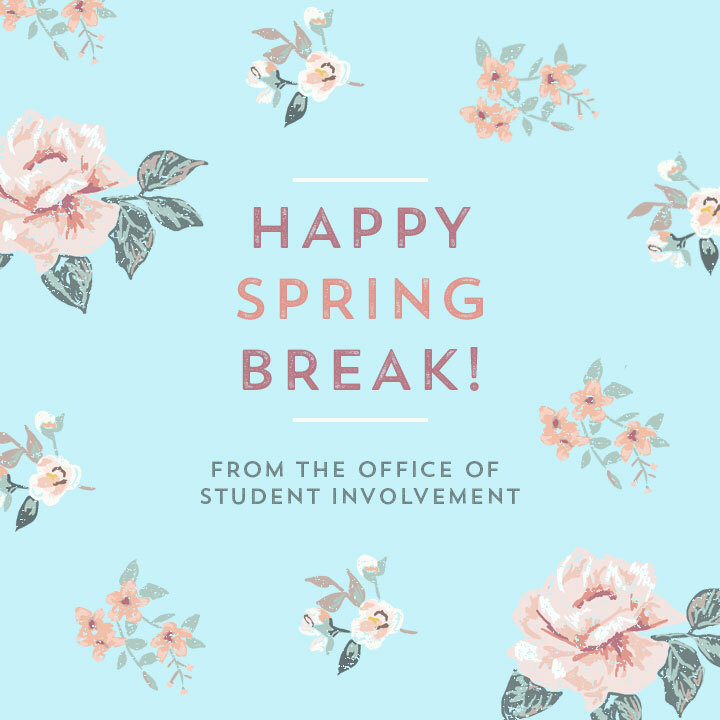 Spring break is finally here…hallelujah! Now all we need is the weather to realize that spring is here and we will be all set. I mean really though, the first day of spring was this past Friday. I don’t know about you but I recall wearing a scarf and boots to class. Don’t get me wrong, I am a huge fan of fall and winter style but I am more than ready to move on. Oh and did you see all this snow today? Not cool, Mother Nature. Not cool. Turning in my final literature review during finals week, felt similar to that feeling I get when I am running late and there is no line at Starbucks. Thank you! With finals over and spring break underway – I finally have time to do whatever I want, right? Well, kind of. I plan to use this brief time off from class to catch up on some much needed me time. I have realized that a large portion of my days are consumed with tending to others (I do enjoy helping others, after all I am studying counseling). But if I don’t take care of myself who will? So I plan to use this week-ish to do things that help me feel “fresh” – fresh means literally feeling refreshed. Kind of like that feeling after you take a good afternoon nap. I usually feel great, similar to what I imagine a child feels like after they nap and need a good 10-20 minutes before anyone talks to them. So some of the things I plan to do during spring break include finishing the book Not That Kind of Girl by Lena Dunham, workout (discovering the workout playlists on Spotify has changed my life- check em out), take a few naps, spend the weekend in New Orleans, paint my nails orange or yellow, and final celebrate my birthday! Hopefully the weather gods (whoever they are) will figure out it’s springtime and bring us some beautiful weather during break. Just remember to enjoy yourself because you earned it after a long week of finals. Dancing to Help The Kids: For All The Right Reasons. In April 2014, I completed my first Dance Marathon—and the third ever DemonTHON at DePaul. 428 registered dancers, 34 directors and assistants, 26 Morale captains, the overall advisor, and I stood 24+ hours For The Kids at Ann & Robert H. Lurie Children’s Hospital of Chicago. These incredible students raised $214,050.46 this year, more than $468,000 to date, and have become the 17th most successful Dance Marathon in the nation! But more than that, they’ve raised awareness For The Kids and families with pediatric illnesses in the Chicagoland area. They did so with their opening video (which conveniently showcases the beautiful city in which I live). They did so with each Morale dance at the top of every hour. They did so with every event held on campus and throughout the Chicagoland area throughout the year. They did so through successful social media efforts before and during the Big Event. I came to DePaul to work as a Program Coordinator for Student Organizations, expecting to supervise student employees in the office and maybe advise a student group. I had no idea how much the latter would impact my life and DePaul experience. During my first month on the job, I reached out to Edwin, the current DemonTHON advisor and offered my help if needed. I later met with Blair, the executive director, who asked if I’d be interested in advising the Morale team. The high school cheerleader/folk dancing camp counselor/karaoke extraordinaire in me was ecstatic. Throughout the year the advisors met weekly with Morale captains, their amazing director and assistants, the overall committee, and management core committee to prepare for this past weekend’s culminating events. Still, I completely underestimated what it would feel like to complete a dance marathon from start to finish. My feet were throbbing and tears (both happy and sad) fell on multiple occasions, but I would will do it all again in a second. All of my dark hours, when I thought I couldn’t keep standing, paled in comparison to what the miracle children and their families face during treatment. I just thought of faces like sweet Mia Gurevitz and how DemonTHON serves them directly. Wouldn’t you keep standing if you saw this face? Fundraising for DemonTHON 2015 is continuing from today until the end of our Big Event on April 24-25, 2015! Every penny counts. Register or donate today! …Lindsay Ritenbaugh is the Program Coordinator for Student Organizations at DePaul University in the Office of Student Involvement. 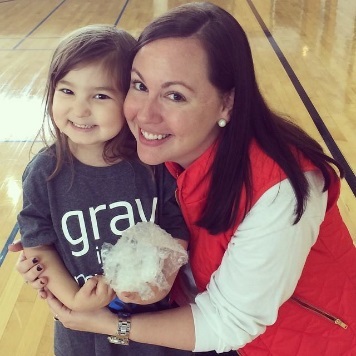 Among dancing and fundraising For The Kids, she enjoys watching Gilmore Girls on Netflix and playing trivia! Happy Finals Week Blue Demons! 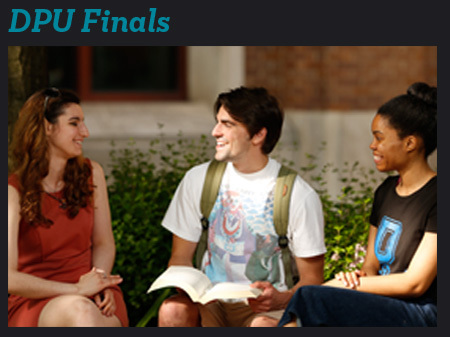 With this quarter coming to an end, our university has many sponsored events just for students to make finals week a little easier. The ever so popular, Vinnie Van is back! Vinnie Van will give students a safe ride home from the John T Richardson Library from 9PM-5AM. The boundaries are: Belmont, Armitage, Clark, and Southport- thank you SGA! The vans will be running from November 20-21 and 24-25. For those night owls. the John T. Richardson Library is now open for 24 hours through November 26th! Don’t forget to bring your student ID, they will be checked at 11pm for safety reasons. JTR is ready for finals, the hall is filled with additional tables and seating! Besides studying hard, don’t forget to do a daily wellness check! Stop by the Ray Meyer Fitness Center for a quick workout before heading to JTR for a study session. The Ray is open Monday-Thursday until 11:30pm and Friday-Sunday until 10pm. Remember, breaking out a sweat and getting a good workout gives you more energy! On November 2nd, 2013 a tragic natural disaster occurred to our neighbors in the Philippines- Typhoon Haiyan. Typhoon Haiyan reportedly took away the lives of 3,900 + people but the world has come together to support the Philippines. As a DePaul community, it is important to keep our neighbors in our thoughts through various forms of support. To donate or help with relief efforts for all those involved with Typhoon Haiyan, please visit https://secure.crs.org/site/Donation2?df_id=6140&6140.donation=form1&s_src=home-page-interupt or your local American Red Cross for further instruction and support opportunities. due to natural disaster or war. 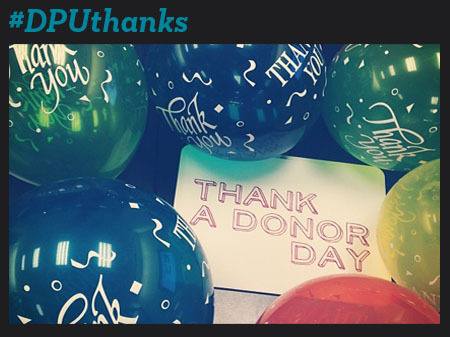 Join the DePaul Future Alumni Association today and tomorrow for Thank a Donor Day! What is Thank a Donor Day? It is a day that DePaul students can drop by an event and thank them for their many contributions for our community! As this quarter comes to an end, stopping by these events is a wonderful way to reflect on your time here at DePaul. What opportunities are you most thankful for? Are you grateful for the campus facilities? Or perhaps the internship and leadership opportunities you’ve been able to succeed in the DPU community? Whatever it is, our donors have a huge impact on these experiences so be sure to thank them!